The Weigh Down Diet book (over 1 million sold!). 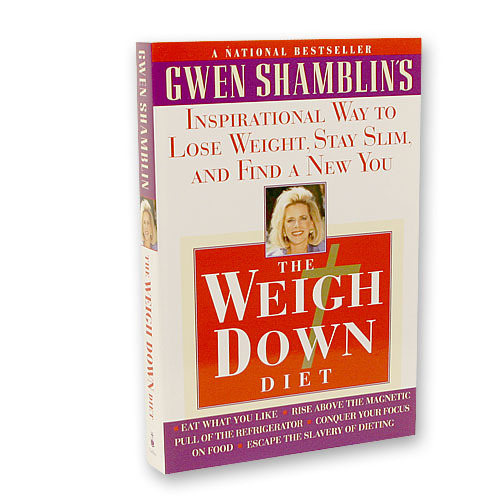 Gwen Shamblin’s groundbreaking approach to weight loss has taught hundreds of thousands of people how to remove the irresistible desire for food. People who have had no control over their late-night binges have learned that they can prevail against the siren call of the refrigerator - because The Weigh Down Diet is not focused on food. It gives new hope and help to millions who have failed on conventional diets and will guide you to the richer satisfaction and nourishment that come not from food but from faith. Chapters include: It’s not Genetics or Your Mother’s Fault, I Feel Hungry All the Time, How to Eat Potato Chips and Chocolate. The Weigh Down Diet book gives back hope to frustrated dieters by teaching that God did not put chocolate or lasagna on earth to torture us but to give us pleasure. Start on the path from physical hunger to spiritual fulfillment today. This book is soft cover and 317 pages. It is full of scripture, Truth, practical tips and testimonies. I got Weigh Down Diet book in 1997 when I began the first Weigh Down class I ever took. I read it along with doing the class homework. It was essential and fundamental for how to apply all the Weigh Down principals. It definitely helped opened my eyes to the answers for how to have permanent weight loss and a deep relationship with God. Weigh Down Diet book says it all powerfully, clearly and directly and gives simple explanations for the how to! I still find encouragement in the Weigh Down Diet book to stay on the narrow road. from Brentwood My favorite book ever! The Weigh Down Diet book has totally changed my life! Gwen Shamblin makes everything so clear and simple, chapter by chapter, on how to lay down overeating and turn to God to fill our hearts. I learned so much from this book and constantly refer back to it for more advice and direction. I am grateful to have this book at hand and recommend it to everyone! It has practical and easy-to-apply advice on how to change a love of food to a love for God! If you want to be free from diets, free from food rules, free from calorie counting, and filled with peace and joy like never before, this book is a great place to start! from Nashville, Tennessee I can still open that book and learn something new about God !! 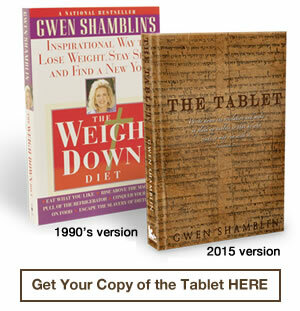 I would have to say that my favorite of all time is the tried and true Weigh Down Diet Book. After having taken my first class over 12 years ago, I can still open that book and learn something new about God !! That would be my favorite pick...honestly though it was hard to choose!! It is ALL so good!! !